With the recent opening of nine more championship holes, Cragun’s Legacy Courses now offers two 18-hole championship courses, along with a unique, Reversible 18-Hole Course which rotates with nine holes of play per day. All three Legacy courses have been designed by Robert Trent Jones, Jr. The newest course is the 19-hole Bobby’s Legacy, named after its designer. It’s a par-73 venue that’s 6,920 yards long, featuring spectacular lake vistas, dramatic elevation changes and is designed to reward shot makers. 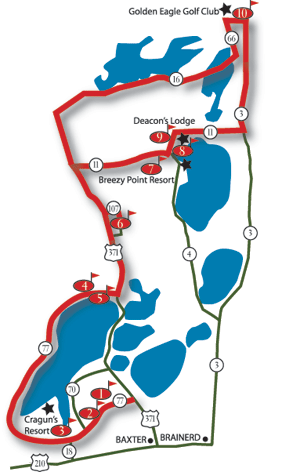 It is already considered to be the Legacy’s showcase course. Bobby’s Legacy is also the location of the 19th hole, nicknamed, “The Gambler’s Hole.” It’s the only hole of its kind in Minnesota, designed for settling playoffs or a little bet. The original 18-hole championship course is called Dutch Legacy, named after the originators of the game of “colf” in the 11th century. The course features moderate elevation changes, with many holes routed through forests and over wetlands. The Dutch Legacy is a par 72 course that’s 6,870 yards long. Rounding out the 55 holes is the unique par three, Reversible 18-Hole Course with 12 greens that can be played in opposite directions on alternate days. Rotating tees and greens create different playing experiences. Jones designed this course in the spirit of the legendary St. Andrews in Scotland, which “rests” alternate holes. As Minnesota’s only Audubon Signature Sanctuary course, woods, water and wetlands come into play on every hole. Wildlife abounds around the Legacy. All the courses have bent grass greens, fairways and tees to enhance the quality of the Legacy golfing experience. Fourteen-hundred feet of cart bridging span wetlands, assuring no “forced carries” for any golfer. Jones’ Risk-Reward design concept allows each player to challenge the architect and “go-for-broke,” or “play-it-safe” on many of the holes. In the style of Robert Trent Jones, Jr., play flexibility has been designed into each of the Legacy Courses. The goal is to allow the course to be played and enjoyed by all levels of golfers. At least nine sets of tees are placed on each hole. The latest in a long list of accolades, Bobby’s Legacy was named, “Minnesota’s Most Artistic Course,” by Golf Minnesota.